Wallach’s highly versatile PentaScope/PentaStar series offers an optical pathway for a direct view. This family of fixed 5-step magnification colposcopes features a built-in dual optical beamsplitter which permits the attachment of 35 mm photographic accessories (traditional and digital), video and co-observation (teaching) tube. Now available with Trulight™ LED lighting system for brighter, whiter light. No need to ever change light bulbs again. All Trulight™ colposcopes come with a 7 year warranty. The colposcopes deliver the 3D image needed to detect subtle tissue abnormalities and to perform colposcopically directed biopsies and surgery with optimum hand/eye coordination. PentaScope features Wallach’s unique overhead suspension system which is solid, yet easily adjustable. The result is total stability through the full range of motion. PentaStar offers the same optics on a 5 point base with center post offering a more compact unit for the budget and space conscious. Video, photography and/or teaching tube may be added simply at any time and at low cost for future needs. 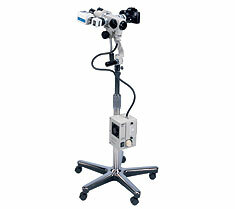 Magnification of 4x, 6x, 10x, 16x and 25x is obtained with a 5-step magnification changer. Retractable vessel delineation filter is incorporated to provide clear visualization of vascular patterns. Image obtained through the accessory ports is identical to that viewed through the binocular tubes via the optical beamsplitter. Trulight™ LED lighting system for whiter, brighter light.